We thought it was time to give you a closer look at some of the pieces from our first collection, ‘Insider’ and a look at some of our inspiration behind it. Essentially the ‘Insider’ is named as such due to the fact that each of the four designs feature a male figure trapped inside a structure, but in fact the meaning goes a little further. At Saxons of Oxford we love to explore boundaries of design and embrace new techniques when approaching a project. We wanted our love for the seemingly impossible to come through in the ‘Insider’ Collection. 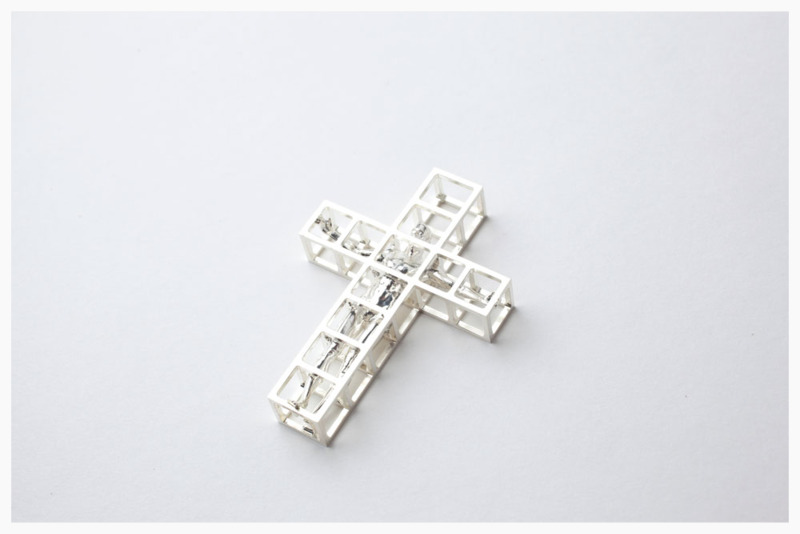 Ultimately ‘Insider’ shows the ideas of entrapment and limitation, but spins them on their head through the fact that these seemingly impossible designs have been translated into jewellery and have overcome those boundaries. The impossible has become possible. Man in a Cage is our signature piece and the focus of this collection. This piece is machined from a solid block of silver to achieve a caged pendant containing a man. The carving enabled us to bring to life our vision and create the minute detail and luxurious finish that we wanted without having to compromise on anything. The existence of the Man in a Cage is down to perseverance and the ability to think outside the box, overcoming a seemingly impossible challenge. The other three pieces expanded from the Man in a Cage, each featuring the same figure and taking inspiration from iconic images. Atlas uses the myth of the eponymous Titan with the weight of the world on his shoulders, which was a punishment for the side he took in war against the Olympians. We took Atlas inside the sphere to represent the concept of restriction within the mind and the way a weight on our shoulders may in fact be more of a mental limit than a reality, bringing the mythological past into contact with the present. What could be better inspiration for our ‘Insider’ collection than the famous image of Leonardo Da Vinci’s Vitruvian Man? We were lucky enough to see an original sketch by Da Vinci at the fantastic 2012 exhibition at the National Gallery in London and were intrigued by his genius of observation. What may come as a surprise is the fact that many of his sketches are in fact little more than palm sized and are extremely intricate. Our Vitruvian Man is our pendant-sized homage to the genius of Da Vinci. The Man Tag pendant takes direct influence from the famous dog tags which are of course a form of military identification. By placing the image of the Insider man inset on one side of the pendant we wanted to put the figure of a person into the identity process and show how the two are so importantly linked. On request Man Tag is able to be formed so that the figure takes on the features of its owner. Ultimately, the ‘Insider’ collection does not simply refer to the image of a man inside something, but is a symbol of the way in which problems are often a product of the mind, and can be overridden by perseverance. Thinking outside the box can bring great results, and this was the overall concept for our first collection.